The nematode resistance gene H2 was mapped to the distal end of chromosome 5 in tetraploid potato. The H2 resistance gene, introduced into cultivated potatoes from the wild diploid species Solanum multidissectum, confers a high level of resistance to the Pa1 pathotype of the potato cyst nematode Globodera pallida. A cross between tetraploid H2-containing breeding clone P55/7 and susceptible potato variety Picasso yielded an F1 population that segregated approximately 1:1 for the resistance phenotype, which is consistent with a single dominant gene in a simplex configuration. Using genome reduction methodologies RenSeq and GenSeq, the segregating F1 population enabled the genetic characterisation of the resistance through a bulked segregant analysis. A diagnostic RenSeq analysis of the parents confirmed that the resistance in P55/7 cannot be explained by previously characterised resistance genes. Only the variety Picasso contained functionally characterised disease resistance genes Rpi-R1, Rpi-R3a, Rpi-R3b variant, Gpa2 and Rx, which was independently confirmed through effector vacuum infiltration assays. RenSeq and GenSeq independently identified sequence polymorphisms linked to the H2 resistance on the top end of potato chromosome 5. 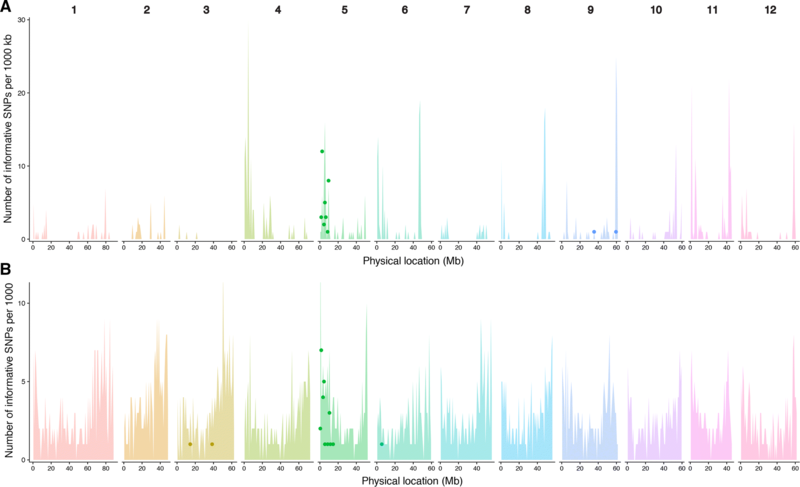 Allele-specific KASP markers further defined the locus containing the H2 gene to a 4.7 Mb interval on the distal short arm of potato chromosome 5 and to positions that correspond to 1.4 MB and 6.1 MB in the potato reference genome. The online version of this article ( https://doi.org/10.1007/s00122-019-03278-4) contains supplementary material, which is available to authorized users. The world population is predicted to reach eight billion by 2025 (Johnson 2001) and will bring with it a need to intensify crop production. Crop loss and damage due to plant parasitic nematodes is currently estimated to amount to $80 billion (£56 billion) annually, with the nematodes of the root-knot and cyst species being the most destructive (Nicol et al. 2010). In the UK alone, the potato cyst nematodes (PCN) Globodera rostochiensis and G. pallida are estimated to account for £26 million worth of crop damage per year (Twining et al. 2009). The increase in intensification of crop production that is required for the anticipated population growth brings with it an increase in the risk of pathogen and parasite infection. In addition, the requirement of long crop rotations due to the persistence of cysts in the soil and increasing restrictions on nematicide use makes breeding of resistant varieties key to mitigating the threat of PCN. Solanum tuberosum ssp. tuberosum originates from South America, and cultivated potatoes introduced into Europe have a relatively narrow genetic base (Bryan et al. 2004). In many cases, effective resistances against major pathogens have been introduced into varieties from wild species. The first example of successful deployment of an effective major PCN resistance was the H1 gene from S. tuberosum ssp. andigena (Ellenby 1954; Gebhardt et al. 1993). Although the H1 gene has not been molecularly characterised, its introduction into varieties has been highly successful in controlling G. rostochiensis infestations in, for example, the UK, where relatively little diversity exists in G. rostochiensis populations (Blok et al. 1997). However, this deployment has caused a shift in nematode populations towards G. pallida, which is not controlled by the H1 resistance gene. Due to multiple G. pallida pathotypes being present in the UK and the lack of a single major resistance gene in potato that confers resistance to these pathotypes, very few potato varieties currently exist that contain sufficiently good resistances for sustained control of G. pallida and suppression of infection. To date, eight resistances against nematodes have been mapped in tomato and potato (Davies and Elling 2015). Cloned and well-characterised resistances include Hero from S. pimpinellifolium (Ganal et al. 1995), Mi1 from S. peruvianum, Gro1-4 originating from S. spegazzinii (Paal et al. 2004) and Gpa2 from S. tuberosum ssp. andigena (van der Voort et al. 1999). Importantly, these genes encode members of the nucleotide-binding, leucine-rich-repeat (NLR) family of resistances that form part of the STAND (Signal Transduction ATPase with Numerous Domains) protein family (Lukasik and Takken 2009). Since NLRs also control other pathogens of Solanaceae such as viruses and oomycetes, significant efforts have focused on this gene family with the aim of identifying and characterising novel pathogen resistances (Jupe et al. 2012). The activation of NLRs, which are overall conserved in their structure (Urbach and Ausubel 2017), typically elicits a complex resistance response including hormones which play a pivotal role in pathogen defence within the plant kingdom (Crampton et al. 2009). Over the last two decades, the cost of whole genome sequencing has steadily decreased, enabling the analysis of large plant genomes. The potato reference genome of the doubled-monoploid S. tuberosum group Phureja clone DM1-3 516 R44 (DM) was published in 2011 (PGSC 2011) and has enabled an in-depth analysis of NLR gene diversity and organisation within the potato genome (Jupe et al. 2012). The development of NLR-specific enrichment sequencing (RenSeq) has facilitated a more comprehensive NLR gene annotation (Jupe et al. 2013). Furthermore, RenSeq, which targets all 755 described NLRs in potato, has been successfully used to map and/or identify functional NLRs against late blight (Chen et al. 2018; Jupe et al. 2013; Witek et al. 2016). Used as a diagnostic tool in wild species or varieties, and referred to as dRenSeq, the technology allows for the rapid assessment as to whether a resistance phenotype is based on already characterised resistances or a hitherto unknown gene (Armstrong et al. 2018; Chen et al. 2018; Jiang et al. 2018; Van Weymers et al. 2016). To compliment RenSeq-based mapping, we previously developed GenSeq, a targeted enrichment sequencing approach of 1980 single or low-copy number genes that can be placed on the individual potato chromosomes with high confidence (Chen et al. 2018). Here, we present the successful application of RenSeq and GenSeq enrichment sequencing (Chen et al. 2018) to genetically characterise the H2 resistance which originates from the wild species S. multidissectum (Dunnett 1961) in a tetraploid background. H2 provides resistance against G. pallida pathotype Pa1 while also conferring a lower level of control to pathotypes Pa2/3 (Blok and Phillips 2012). The two enrichment sequencing approaches, in combination with a bulked segregant analysis, independently mapped the H2 resistance to the short arm of chromosome 5. A cross between the susceptible variety Picasso and the resistant clone P55/7 yielded true seeds from which an initial F1 population of 192 progeny clones was used for the phenotyping of the G. pallida H2 resistance. Plants underwent two independent cycles of infection assays with Pa1 cysts to determine whether they were resistant or susceptible. In addition to the resistant and susceptible parents P55/7 and Picasso, 192 F1 progeny clones were grown and phenotyped over 2 years. In year one, 154 F1 progeny plants were assessed, while in year two all 192 F1 progeny plants were phenotyped. For both cycles of phenotyping, each progeny clone was propagated to generate three replicated clonal plants which were each infected with 15 ± 2 Pa1 cysts, respectively. Progeny plants were established in root trainers and left to grow for 7 days before infection with Pa1 cysts. Infected plants were left for 8 weeks before the root trainers were opened to expose the root system. Visible females were counted from all sides of the root system. Average scores were calculated from technical replicates and, where possible, from year one and two replicates. 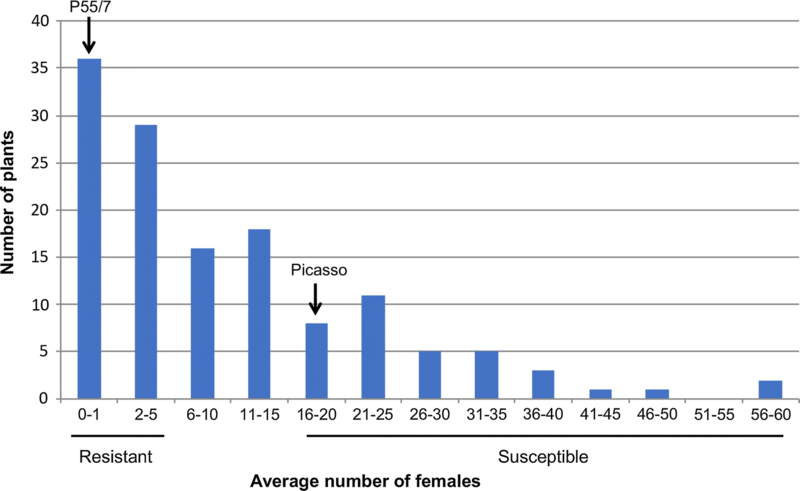 Using the average scores of the parental controls (resistant P55/7: average < 1; susceptible Picasso: average > 18), progeny clones were classed as very resistant (< 1 female) or susceptible (> 18 females). Across the 2 years of infection assays, 57 clones were phenotyped in both technical and biological replicates. Any clone that displayed contradictory phenotypes between the two assays was removed, and only the 20 most resistant and susceptible progeny plants were selected for further analysis. Where insufficient progeny plants with contrasting phenotypes were identified in the combined year one and two phenotyping assays, clones with consistent phenotypes in year two were chosen as inoculations yielded the most robust root infections. DNA extraction from potato leaves along with GenSeq and RenSeq sequencing library preparation was undertaken according to Chen et al. (2018). The bait libraries for GenSeq and RenSeq have been described by Chen et al. (2018) and can be obtained from http://solanum.hutton.ac.uk. Paired-end Illumina MiSeq reads were first checked with FastQC (Andrews 2010) and then quality and adapter trimmed with cutadapt v1.9.1 (Aronesty 2011) to a minimum base quality of 20. All reads are publicly available and have been submitted to the European Nucleotide Archive (https://www.ebi.ac.uk/ena) with the ENA accession number PRJEB28455. For the genetic mapping of the resistance, trimmed RenSeq or GenSeq reads were mapped to the DM potato reference genome (v4.03) (PGSC 2011; Sharma et al. 2013) using Bowtie2 v2.2.1 (Langmead and Salzberg 2012) in very-sensitive end-to-end mode. Discordant and mixed mappings were disabled, and the maximum insert was set to 1000 bp. Three score-min parameters were used in different mapping runs: “L, − 0.12, − 0.12”, “L, − 0.18, − 0.18” and “L, − 0.3, − 0.3”, approximately equal to 2%, 3%, and 5% mismatch rates, respectively. The resulting BAM files were sorted, merged and indexed using SAMtools (Li et al. 2009). Pile-up files were generated for the bulks and parents using SAMtools mpileup with default settings and piped into VarScan mpileup2snp (Koboldt et al. 2012) with—strand-filter 0 and—output-vcf 1 for variant calling. For the dRenSeq analysis, RenSeq reads were mapped against a bespoke set of functionally characterised NLRs, including their 5′ and 3′ flanking region (Armstrong et al. 2018). In addition to the references described by Armstrong et al. (2018), additional NLRs Gro1-4 [AY196151] (Paal et al. 2004); Hero [AJ457051] (Ganal et al. 1995); Mi1.1 [AF039681] and Mi1.2 [AF039682] (Milligan et al. 1998); Rpi-abpt [FJ536324.1] (Lokossou et al. 2009); Rpi-amr [KT373889] (Witek et al. 2016); and Rpi-Ph-3 [KJ563933.1] (Zhang et al. 2014) were included. Only paired-end reads were mapped using the score-min parameter L, − 0.01, − 0.01. This results in a mismatch penalty of 5 per 250 bp to only map reads without any high-quality polymorphisms compared to the reference set. Due to the high nucleotide similarity of NB-LRR sequences, this enabled mapping to a maximum of ten positions (− k 10). The resulting BAM file was aligned and indexed using SAMtools (Li et al. 2009) v1.3.1. Read depth and coverage were calculated using BEDTools (Quinlan and Hall 2010). Data were subsequently transformed and plotted using a custom script in R Studio (RStudio 2014). SNPs were filtered using a custom Java code to retain informative SNPs present in both bulks and parents. SNPs were filtered based on expected allele ratios for susceptibility/resistance plants and bulks (susceptible: rrrr; resistant: Rrrr). To be retained, each informative SNP had to be supported by a minimum of 50 RenSeq or GenSeq reads, respectively, and be present in an alternate allele frequency reflecting the expected genotype. Using ‘r’ as a reference, a 0–5% alternate allele frequency was selected in susceptible plants and 20–30% alternate allele for resistant plants. Conversely, using ‘R’ as a reference, SNPs that displayed 95–100% alternate allele frequency in susceptible plants and 70–80% alternate allele frequency in resistant plants were filtered. 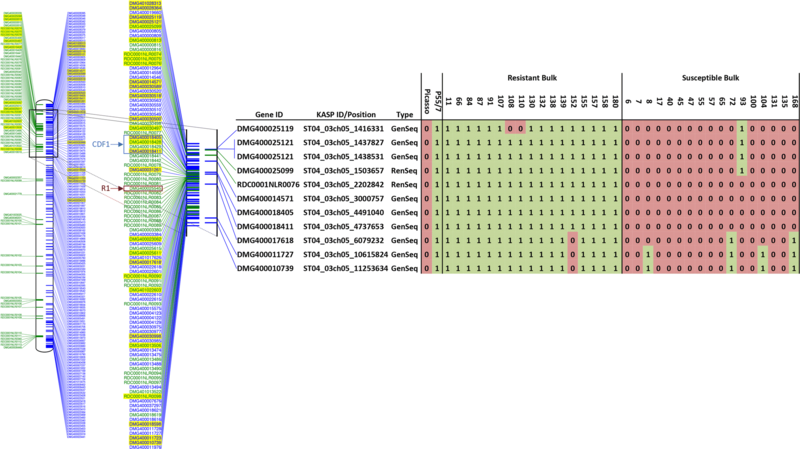 BEDTools intersect (Quinlan and Hall 2010) was used to extract SNPs present in both bulks and parents (informative SNPs) and to relate the informative SNP locations to the PGSC v3.4 gene annotations. The number of parental, bulk and informative SNPs from RenSeq and GenSeq was plotted in 1 Mb bins across each chromosome and visualised using R (R Core 2018). Percentage of on-target reads was calculated as the proportion of reads mapping to annotated GenSeq or RenSeq target regions within the DM reference genome. Intersecting these regions (± 1000 bp) against the mapped reads using BEDTools gave the number of on-target reads. These on-target reads were then displayed as a proportion of the total number of mapped reads. Read coverage to target regions was calculated by dividing the total number of GenSeq/RenSeq mapped base pairs (± 1000 bp) by the total length of the GenSeq/RenSeq genes (+ 2000 bp per gene). Allele-specific KASP markers were designed against informative chromosome 5 SNPs identified through RenSeq and GenSeq under different mapping mismatch rates. Sequences flanking the informative SNPs 50 bp upstream and downstream were extracted and used in a MEGABLAST against the DM genome v4.03 via the BLAST + command line application (Camacho et al. 2009) at default settings to establish the potential specificity. In total, 11 KASP designs had no off-target BLAST hits compared to the DM genome (defined as > 95% sequence identity over at least 28 bp) and were advanced for KASP marker synthesis (Table S1). SNP markers were designed according to LGC Genomics specification. Assays were carried out in 8.11 μl, 4 μl gDNA (20 ng/μl), 4 μl KASP Master Mix (LGC Genomics) and 0.11 μl KASP primer mix (KASP designed oligos). PCR reactions were undertaken using a StepOnePlus thermocycler with the following conditions: 2 min at 20 °C, ten cycles of 15 min at 94 °C, 20 s at 94 °C, 1 min at 62 °C (decreasing by 0.7 °C per cycle), 32 cycles of 20 s at 94 °C, 1 min at 55 °C and 2 min at 20 °C. Recombinant Agrobacterium tumefaciens was grown overnight in 10 ml LB medium. Samples were centrifuged and resuspended in 5 ml Agro-mix (10 mM MES, 10 mM MgCl2, 150 µM acetosyringone) and diluted with an OD600nm of 0.5. Samples were then kept in the dark and left to incubate on a shaking plate at room temperature for 3 h. Potato leaves were subsequently vacuum infiltrated as described previously (Wei et al. 2007). A cross between the H2-containing resistant clone P55/7 and the susceptible variety Picasso was assessed for segregation of G. pallida resistance. Out of the 192 F1 progeny, 154 plants were successfully assessed in two independent phenotypic screens using three plants per genotype. In screen 1, 11 progeny plants were scored as very resistant (average ≤ 1 females), 23 as very susceptible (average ≥ 17 females) and 28 clones as intermediately susceptible (average > 1, < 17). For screen 2, 27 clones were scored as very resistant (≤ 1 females), 32 progeny clones as susceptible (≥ 18 females) and 69 as intermediately susceptible (> 1, < 18) (Table S2). Based on the mean number of females present across the three biological replicates and two independent experimental repeats, the distribution of the plant resistance was plotted (Fig. 1). The progeny segregated with a 0.8:1 (resistant: susceptible) ratio (χ2 = 0.04, p > 0.84) which is close to the 1:1 ratio expected for a simplex dominant resistance allele segregating in a tetraploid cross (Rrrr × rrrr). The 20 most consistently very resistant progeny (scoring ≤ 1 female) and 20 consistently very susceptible progeny plants (scoring ≥ 18 females) were selected for further genetic analysis using a bulk-segregant analysis approach. To evaluate whether the resistance phenotype in the resistant clone P55/7 and segregating within the F1 progeny could be associated with an already characterised NLR, diagnostic RenSeq (dRenSeq) analysis was conducted. RenSeq-enriched paired-end reads were mapped against a panel of known functional NLRs including the nematode resistance genes Gpa2, Gro1.4, Hero and Mi1.1/1.2 to assess their presence within Picasso and P55/7. For a gene to be considered ‘present’ within a variety, the sequence had to be identical when compared to the reference gene coding sequence. DRenSeq analysis in susceptible Picasso identified NLRs Gpa2, P. infestans R genes (Rpi) Rpi-R1, Rpi-R3a, Rpi-R3b variant Rpi-R3bG1696/G3111 described by Armstrong et al. (2018) and the NLR Rx effective against potato virus X. In contrast, no known characterised NLR was identified in the breeding clone P55/7 (Fig. 2). To verify the dRenSeq results, in planta testing was conducted to confirm the presence and functionality of identified NLRs in Picasso and their absence in P55/7. Cognate avirulence (Avr) genes of selected NLRs were cloned into a suitable binary vector and delivered via A. tumefaciens vacuum infiltration into young Picasso and P55/7 leaves to assess recognition via cell death responses (Fig. S1). In perfect agreement with dRenSeq, transient expression of Avr genes RBP1 (recognised by Gpa2 (Sacco et al. 2009)), Avr3aKI (recognised by Rpi-R3a (Bos et al. 2009; Chapman et al. 2014)), Avr3b (recognised by Rpi-R3b (Li et al. 2011)) and Cp (recognised by Rx (Bendahmane et al. 1995)) in Picasso but not in P55/7 elicited a cell death response. Transient expression of positive control CRN2 (Haas et al. 2009) elicited a strong and consistent response in both Picasso and P55/7, whereas no response was elicited by the control constructs (eGFP and Avr2 (recognised by Rpi-R2)(Gilroy et al. 2011)). DRenSeq in combination with resistance tests confirmed that Gpa2 from Picasso (which segregated in the F1 population and was found in both bulked resistant and bulked susceptible progeny clones—data not shown) does not control G. pallida pathotype Pa1. Thereby, dRenSeq provides evidence that the H2 resistance is based on a hitherto unknown gene and cannot be explained by the presence of previously characterised NLRs. To genetically characterise the H2 resistance, we conducted a bulked segregant analysis using individually indexed parents, bulked susceptible and bulked resistant samples (Table S2). The individually indexed genomic DNA samples from both parents and the two bulks were first subjected to RenSeq-based enrichment sequencing, which specifically targets NLRs (Jupe et al. 2013). From a total of 8,511,314 paired-end reads obtained from RenSeq, 8,477,489 passed read trimming. The on-target mapping rate to the DM reference ranged from 30.37 to 61.86% (Table 1). 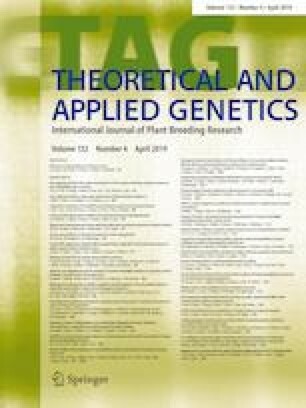 Based on the phenotypic segregation ratio of nearly 1:1, which suggests that a single gene in a simplex configuration underpins the H2 resistance, SNPs conforming to the expected ratios (‘Rrrr’ in P55/7 and resistant bulk as well as ‘rrrr’ in Picasso and susceptible bulks) were retained. This analysis was independently conducted at 2%, 3% and 5% mapping mismatch rates to allow for sequence variations compared to the DM reference genome. At a 3% mismatch rate, 3314 SNPs were identified between the parents Picasso and P55/7 that conformed to the expected allele frequency. In the bulks, 106 SNPs passed the filtering conditions expected for susceptible as well as resistant progeny. Of those SNPs, 36 were independently identified at the expected allele frequency in the parents and the bulks (Fig. 3a). The 36 SNPs correspond to 15 NLRs in the DM genome. More than 94% of these SNPs (34 out of 36) reside in an 8.1 MB interval on potato chromosome 5 and can be attributed to 13 NLRs. The remaining two SNPs correspond to two NLRs on chromosome 9 (Table 2). Relaxing the mapping mismatch rates to 5% or increasing the stringency to 2% yielded 6192 SNPs and 1602 SNPs in the parents, respectively. In the bulks and parents, 66 and 10 SNPs passed the filtering criteria at these mismatch rates, respectively (Tables S3 and S4). In agreement with the 3% mismatch rate, most SNPs that passed the filtering criteria independently in the parents and bulks are associated with NLRs from chromosome 5. At the 5% mismatch rate, 55/66 SNPs (> 83%) can be attributed to 16 NLRs that reside in the same interval identified at the 3% mismatch rate between positions 1.5–9.6 MB (Table S3). At a 2% mismatch rate, 70% of SNPs are associated with a similar interval on potato chromosome 5 (Table S4). To independently validate the RenSeq-inferred mapping position of H2 to chromosome 5, the indexed parents and bulks used for RenSeq were also subjected to GenSeq-based enrichment. The on-target rate for GenSeq reads was comparable to RenSeq and ranged from 44.85 to 75.01%. As with the RenSeq sequencing data, GenSeq-derived reads were mapped to the DM genome at different mismatch thresholds including 2%, 3% and 5% (Table 1). Filtering for informative SNPs, which were independently identified in the bulks and parents, yielded 18 SNPs at a 2% mismatch rate (Table S5), 28 SNPs at a 3% mismatch rate (Table 3) and 54 SNPs at a 5% mismatch rate (Table S6). Importantly, the majority of these SNPs, ranging from 87% at a 5% mismatch rate, 89% at the 3% mismatch rate to over 94% at the 2% mismatch rate, correspond to genes associated with the top end of chromosome 5 (Fig. 3b). Combining the data from RenSeq and GenSeq analyses independently corroborated the mapping position of the H2 resistance to an approximately 11 MB interval on potato chromosome 5 (Fig. 3a and b). To validate the linkage of RenSeq- and GenSeq-derived SNPs to H2 and to further define the mapping interval on chromosome 5, SNPs were converted into allele-specific KASP markers. 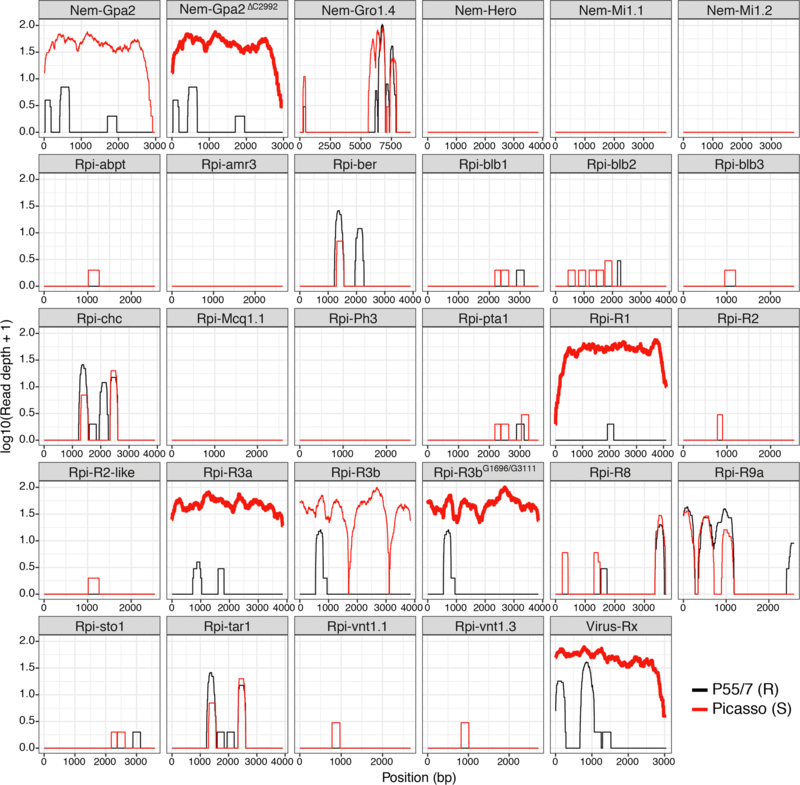 In total, 11 KASP markers were designed based on nine GenSeq SNPs and two RenSeq SNPs (Table S1). All RenSeq-derived SNPs and seven GenSeq-based polymorphisms were based on the 3% mismatch threshold. In addition, one SNP from the GenSeq analysis conducted at a 5% mismatch rate (PGSC0003DMG400018411) and one SNP from the 2% mismatch analysis (PGSC0003DMG400017618) were included. The marker designations reflect their positions within the DM genome version 4.3. For example, marker ST04_03ch05_1416331 is located on chromosome 5 at position 1416,331 bp within the DM reference genome. The F1 progeny clones used to generate the bulked resistant and susceptible pools were individually analysed using GenSeq- and RenSeq-derived KASP markers. Using the allele discrimination output from each KASP assay, a graphical genotype could be assigned that corresponds to the ‘R’ or ‘r’ alleles, respectively. Each allele assessed with a KASP marker was assigned a ‘1’ (green) if it originated from the resistant parent (P55/7), while those designated ‘0’ (red) showed the same allele as the susceptible parent (Picasso) (Fig. 4). Arranging the phenotypes of the individual progeny clones with the KASP marker-derived genotype revealed three recombination events in resistant F1 clones 108, 110 and 152 as well as five recombinations in susceptible clones 8, 72, 93, 104 and 168. The most informative markers for delimiting the H2 interval were RenSeq marker ST04_03ch05_1503657 which is based on NLR PGSC0003DMG400025099 and GenSeq marker ST04_03ch05_6079232 detecting an informative SNP in PGSC0003DMG400017618. These markers identified one recombination event (susceptible clone 93) and three recombination events (resistant clone 152 and susceptible clones 72 and 168), respectively, and thereby reduced the H2 locus to 4.7 Mb. Importantly, the marker order as inferred by the DM potato reference genome is conserved in this interval as no apparent double recombination events are observed in either parent or F1 progeny. Globally, nematodes are found in every ecological niche and those specialised as plant parasitic nematodes pose a serious and continuous threat to global crop production (Masler 2013). Of particular importance to potato are the cyst nematodes G. pallida and G. rostochiensis but root-knot nematodes such as Meloidogyne incognita, M. arenaria and M. javanica, M. hapla, M. fallax and M. chitwoodi also threaten Solanaceous plants (Caromel and Gebhardt 2011). Globodera ssp. have formed a very close relationship with Solanum ssp. which indicates a long process of coevolution between the nematodes and their hosts. Indeed, it has been speculated that the Incas introduced 6–8 years potato crop rotation in South America to mitigate PCN (Picard et al. 2007). Several distinct pathotypes (subpopulations) have been reported for G. rostochiensis and G. pallida that are differentiated based on their ability to infect Solanum ssp. containing different resistances (Kort et al. 1977). Compared to other diseases such as late blight caused by the oomycete pathogen P. infestans, very few resistances effective against PCN have been characterised. To date, no NLR has been discovered which confers complete resistance to all European pathotypes of G. pallida (Pa1, Pa2/3) and current crop protection relies therefore on the application of chemicals or limited utilisation of quantitative resistances. Breeding for quantitative resistance is, however, extremely challenging due to the complexities of incorporating multiple genes with minor effects simultaneously into commercially viable varieties. Conversely, reliance on a single major NLR in the face of a variable pathogen population may mean that the effectiveness of this resistance is short-lived (van der Voort et al. 2000). Pyramiding multiple complimentary NLR genes is a desirable approach to prolong the longevity of NLRs. With regard to PCN resistance, the H2 gene is a good candidate due to its strong resistance phenotype to G. pallida Pa1 and the partial resistance it provides to Pa2/3. In this study, we successfully mapped the H2 resistance to a 4.7 MB interval on potato chromosome 5. This is a first step towards the cloning of the H2 resistance gene which could then be deployed in varieties and combined through dRenSeq technology with complimentary resistances such as H3 or GpaV and others as and when they are characterised (Armstrong et al. 2018). The mapping of H2 was carried out in a tetraploid background which is, compared to a diploid configuration, more complex. Nevertheless, genome reduction in combination with bulked segregant analysis not only identified sequence polymorphisms (SNPs) linked to the resistance trait (Fig. 3) but also identified flanking markers ST04_03ch05_1503657 and ST04_03ch05_6079232 that can be used to screen a larger segregating population that has been established to identify recombinant clones in the H2 interval (Fig. 4). The relative position of the H2 resistance genes on potato chromosome 5 is in the vicinity of the late blight resistance gene R1 (Ballovora et al. 2002) and the Cycling Dof Factor1 (StCDF1) that controls earliness (Hannapel et al. 2017; Fig. 4). The combination of GenSeq and RenSeq (Chen et al. 2018) targets less than 3000 genes and thereby approximately 1% of the potato genome for resequencing. The reduction in genome complexity and the resequencing of single/low-copy genes (GenSeq) or NLRs (RenSeq) can unambiguously inform the gene positions in the potato genome or represent putative candidates genes, respectively. Previous work carried out using GenSeq and RenSeq successfully mapped the late blight resistance gene Rpi-ver1 from the diploid, wild, inbreeding potato species S. verrucosum (Chen et al. 2018) but this study confirms that this approach is also suitable for mapping in tetraploid species. Furthermore, using the RenSeq-derived reads from the progeny parents in a diagnostic analysis (dRenSeq) rather than a mapping study confirmed that the H2 resistance cannot be explained by previously identified genes including those associated with nematodes, viruses, or late blight resistance (Fig. 2). Whereas dRenSeq did not identify any known NLRs in P55/7, several functional NLRs, including the nematode resistance gene Gpa2, were identified in the susceptible variety Picasso (Armstrong et al. 2018). Although we could discount the probability that Gpa2 significantly contributed to the resistance observed to the G. pallida pathotype used in this experiment, further studies may be warranted to explore whether combining the Gpa2 and H2 resistances has any merit. Indeed, Gpa2 segregated in the resulting F1 progeny population and was identified, through dRenSeq, in both resistant and susceptible bulks (data not shown). Since pyramiding partially effective PCN resistance loci is an important part of resistance-breeding strategies, future studies could assess the combined effects of Gpa2 and H2 resistances in selected progeny clones on controlling more diverse nematode populations. The presence of NLR Rx in Picasso limited the use of the PVX agro-infection assay to validate the dRenSeq data, and instead, the functionality of these genes was tested using an Agrobacteria-based vacuum infiltration approach. In line with dRenSeq, the transient expression of cognate pathogen effectors confirmed the functionality of the identified genes in Picasso and did not elicit a response in P55/7. This provides evidence that dRenSeq is highly robust and, as more and more genes are functionally characterised, provides a tool that can be universally applied to prioritise novel resistances against diverse pathogens including late blight and nematodes. In this study, we have further developed the RenSeq and GenSeq analysis tools and algorithms required to map NLRs in a tetraploid configuration. Furthermore, we have shown that the RenSeq, dRenSeq and GenSeq workflows are not limited to P. infestans resistances and can be applied to map NLRs effective towards diverse pathogens including PCN. This work was supported by the Rural & Environment Science & Analytical Services Division of the Scottish Government, the BBSRC, through the joint projects CRF/2009/SCRI/SOP 0929, BB/L008025/1 and BB/K018299/1. Additional funding was obtained through the James Hutton Institute SEEDCORN initiative, AHDB Potato, the Perry Foundation and The Felix Cobbold Trust. Amanpreet Kaur was supported by the Commonwealth Scholarship Commission through a Commonwealth split-site Ph.D. grant. We would like to thank Dr Pete Hedley and Mrs Jenny Morris at the Genome Technology group at the James Hutton Institute for their invaluable support with MiSeq sequencing. SS conducted the PCN resistance screening and KASP-based mapping. SS and MA conducted the enrichment sequencing. MA, KB and TYL conducted the computational analysis and KASP design. SS, KW and AK conducted effector recognition analysis. IH, VB, GB and SS conceived and wrote the manuscript. IH, JJ, VB, GB designed the molecular experiments.